Welcome to my little corner of MallofMemphis.org! If you are reading this, then it means you are interested to know more about me! I am a lifelong Memphian. While I have several issues with the way this city is run, and how things generally have gone here, I do love Memphis itself, and the unique culture and history the city has. That being said, it becomes obvious that the Mall of Memphis is the prime example of the city of Memphis having something amazing, and losing it in a very short time. 22 years is nothing for a building to have been built and destroyed in, and I feel Memphis lost something amazing with the death of the Mall. 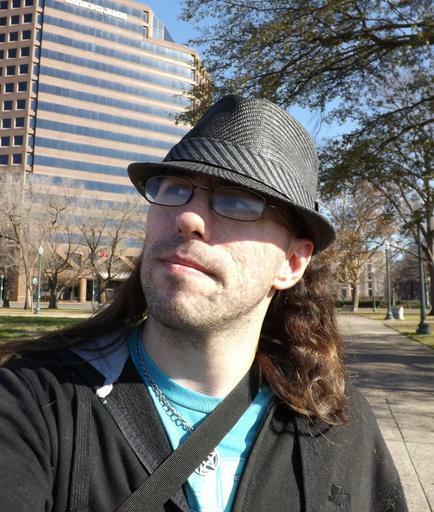 The Mall of Memphis is a critical part of me, since my mother lived in the Parkway Village area when I was born. Back in '85, it was a nice enough area, after all. My mother would tell me stories about how even as an infant, I loved going to the mall! I would always be happy there, and if I was ever upset at home, a quick trip to the Mall of Memphis would cheer me up. What have you provided to the site? I have brought many thoughts, and memories to the site via text. I sadly can provide nothing much of the malls life in photographs, but there is one elusive video out there of the mall in it's last day. I took it with a mini-tape video camera, and only got to the ice rink and escalators before security made me stop filming. However, nothing prevented me on that cold day in 2003 from filming the outside of the building! Indeed, that tape, which is currently "misplaced", seems to contain the most thorough documentation of the outside appearance of the whole building, and what it was like to drive around the property. There exists one digital copy of the video, which I am trying to get from the person who copied it. Hopefully, they will have it available and can send that copy to me, for me to use in a future project. The video snippet that graces the front page of this site actually makes use of my original video recording from 2003! Do you have anything from the mall? I have collected and stored in a box, several small objects found on the property: electrical outlets, junction boxes, bush limbs, even a large tree limb! I have also collected a few of the sprinkler heads from the watering system, and also a few pieces of glass and stone, possibly from storefronts and decoration in the building. I also, recently, have come into possession of one other rather special object from the mall, an object that is one of the most critical to us having had the mall as it was. An object which hung in the mall for all 22 years of its life. 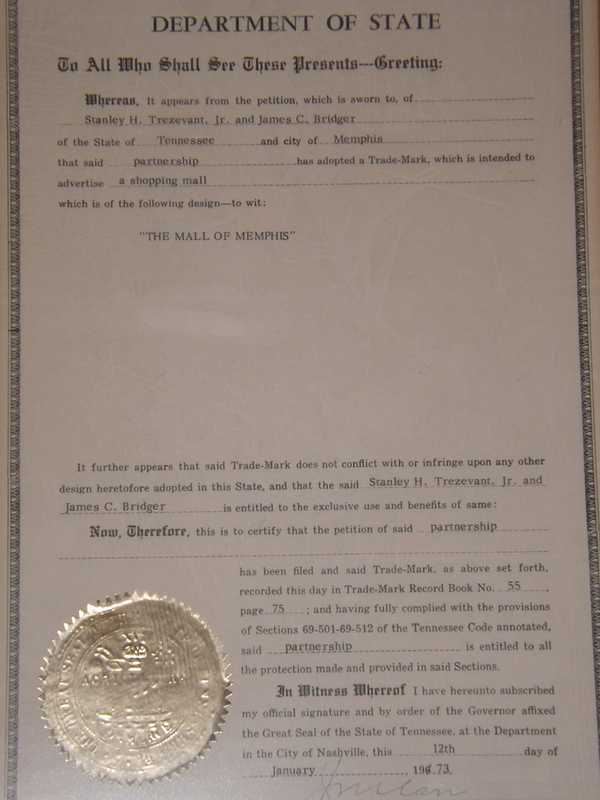 The State of Tennessee trademark registration for "The Mall of Memphis"! Easy! Just use the links available from my about.me page, or contact me directly from my website! I would love to hear from anyone who has a story to tell about the mall!